Bullz-Eye arrived in Dallas Saturday morning to sunshine and a warm welcome from our fellow bloggers from the “Game On” Blogger road trip to the Big Game. We were stopped in our tracks Friday night in Ennis, Texas due to icy roads but the final 30 miles into Dallas were smooth and filled with anticipation. The Chrysler 200 delivered all the way for our 4th and final leg of the Drive to Dallas and we’re optimistic about the future of this new mid-sized sedan from Chrysler. We’re seeing bulls everywhere we go in Dallas so we feel right at home (check out the photos above). 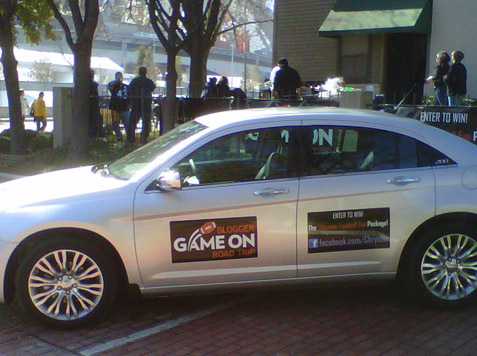 Today we’ll be heading to a house in eyesight of Cowboys Stadium for a day-long tailgating event with the whole Chrysler 200 road trip team. Everyone had their own time in the 2011 Chrysler 200 during their leg of the trip with different obstacles and challenges to overcome, including some of the coldest winter weather of the season thus far! Now it all hits the top of the mountain with the Big Game tonight and we’re going to be a part of history. This was a big logistical undertaking by the team at Chrysler and we thank them for allowing Bullz-Eye.com to be a part of something special and very fun. Look for plenty of video from our Drive to Dallas road trip to be posted very soon so you can get an inside look at our very interesting experience. Now it’s all on Green Bay and Pittsburgh to battle it out in what should be an game! We’re stuck in Ennis, Texas . . .! We’re 30 miles from Dallas and Bullz-Eye and the other “Game On” Bloggers are stopped in our Chrysler 200s just outside of the Big “D” because of icy road conditions. With the Big Game just a few days away on Friday night, there were virtually no road crews out on Interstate but plenty of police cars (in rear wheel drive Ford Crown Vics) assisting those poor souls who were sliding off the highway left and right. We witnessed one vehicle going in the opposite direction cross a wide center beam and crashing into the guard rail in an amazing loss of control (Brad from SportsGrid.com has the photo here). That happened about 20 miles from where we were shut down. We wanted to keep going but we didn’t have a choice. 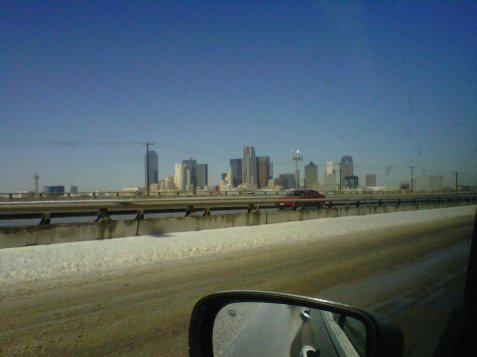 Would it have been that hard for Dallas officials to find salt trucks from up North once they knew the weather reports? Earlier in the day we visited the Texas Junk store in Houston where a guy named Bob sells used (that’s right . 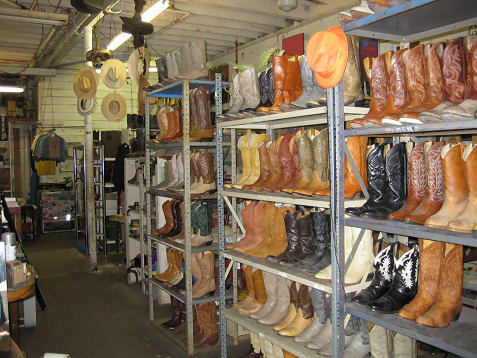 . . “used”) cowboy boots from all over the country. Bob was a great host and stays pretty busy for someone who keeps his store open only two days per week. Nice work Bob! The roads out of Houston were really no issue for our convoy of vehicles so we stopped for a great lunch at Taqueria Y Restaurant where the service and Tex Mex food were just what we were craving. A few hours later we were unpacking at the Holiday Inn Xpress in Ennis, but if the weather improves as forecasted we’ll be back in our 2011 Chrysler 200s early Saturday for our long awaited arrival in Dallas. In the meantime our fellow bloggers including The Bachelor Guy will hold it down in Dallas until Bullz-Eye rolls in. As much as we wish we were reporting from Dallas our team is safe for the night and getting really pumped up for the Green Bay vs. Pittsburgh showdown on Sunday!